Shouldn’t your members be getting mortgages from you? We make it possible for credit unions of any size to offer conventional and government loan options to members! The relationship with myCUmortgage continues to get stronger. The ability to consistently communicate with the underwriting team provides TopMark FCU a member service advantage in our market! Commodore Perry FCU takes advantage of several comprehensive solutions from myCUmortgage that will empower them to become exceptional mortgage lenders. Want to stay on top of our mortgage obsession and in-the-know with everything myCUmortgage? Then you'll want to be sure to follow us on LinkedIn and Twitter! You Certainly Seized the Mortgage! 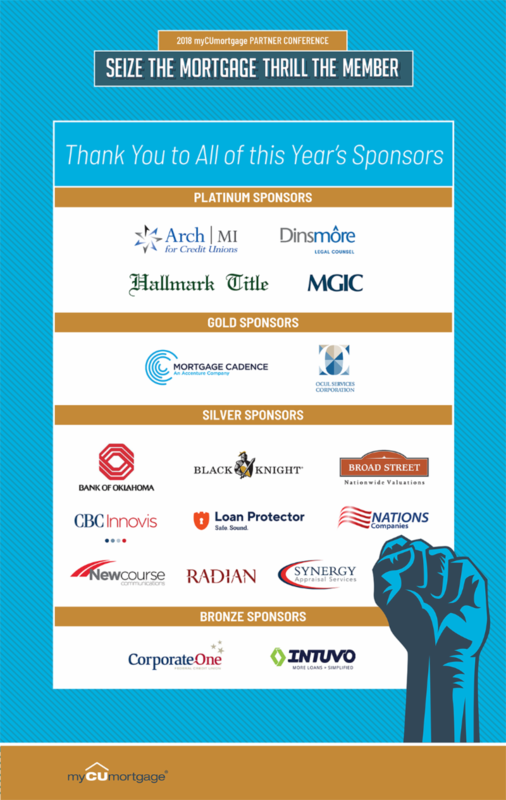 THANK YOU to all credit union attendees and sponsors of this year’s myCUmortgage Partner Conference! It was bigger and better than ever! Check out some of the photos from the event.